By Paul T. Huling, Sr. Soon after Dad died, I went through his desk drawers and found a letter that he'd had filed away since 1934. The letter was about hope. Hope and Christmas. Christmas day 1933 was cold and rainy. My family had exchanged our Christmas gifts, eaten our Christmas dinner, and gone to church, where... each of us children [were presented] with a lovely orange. It was too miserable outside to play very long. Inside, the adults were quietly resting while we kids went to the play area of the basement. The centerpiece of the basement was the hand-fired coal furnace, which gave off enough heat to keep the basement quite warm. There was even a bed, which I remember sleeping on a few times, and hiding places, a Ping-Pong table, a workbench, and a game table. There was a gentle knock on the back door just before the early winter darkness set in. I answered the knock to find a man standing in the cold. He asked if he could speak to the man of the house. Dad came to the door, and the two men spoke for a few moments before Dad asked the man to step into the hallway. Dad left, spoke to Mom for a moment, then asked the man to follow him to the basement. My brothers and I listened in as we worked quietly on the model airplane on the other side of the furnace. The man was hungry. Mom fixed him the same dinner we had enjoyed, while Dad talked to him and set up a table. The man told Dad he didn't want to impose on our Christmas; he just needed something to eat as he moved on his way. But Dad could see the man needed more. He was a "bum"; that's what people generally called out-of-work men who were homeless. But there was something about this man that made the word "bum" seem out of place. It was obvious the man was well-educated but terribly down on his luck. He was far from home, lonely, desperate for work, and pretty dirty. Dad provided soap and towels so the man could clean up before eating. He hung his outer clothes over a rack to dry by the warm furnace. The man's shoes were worn through and mushy with wetness. Dad threw them into the furnace, where they hissed and steamed for a long time before they finally burned. Dad discovered that his good hunting boots were a perfect fit for the man. He gave the boots to him along with woolly socks he had stored in the basement armoire. You would have thought Dad had given the man $100. The man talked about home and family, hundreds of miles away. He had left with the hope of finding work, but when he had reached his destination, there were no jobs, and he had no more money. Now he was walking and riding the rails, trying to go home. But he didn't know where each train he hopped would take him. He hunted for work in towns along the way. He had had a fine education, fine job, and a fine family -- now he had nothing but hope to keep him going. He and Dad talked for a long time. Then he left -- clean, dry, well-fed, and very appreciative of the help he had been given. None of us slept well that night as we thought of the man out in the cold with nothing but hope. I thought of his kids at home, not knowing where their dad was. About a year later Dad and Mom read us a letter from the man who had come for Christmas. He was home. He had work. His family was OK. He also said in the letter that the reason he turned in at our house as he was walking the streets looking for food was because there was a mark on the sidewalk, placed there by someone else, indicating that at this house you would not be turned away. I looked for the mark but never found it. It made me proud, though. As I read the letter, soon after Dad's death, I recalled the story. In the letter, the man said he never lost hope because of people like Dad and Mom. "My feet stayed warm and dry all the way from LaSalle, Illinois, to Iola, Kansas," he wrote." unto salvation ready to be revealed in the last time. Reprinted from Lunch at the Igloo and Other Stories: A Tribute to the Great Depression by Paul Huling and Don Huling (Hither Page Press, Princeton, IL), pp. 40-42. Paul T. Huling, Sr. (deceased) is the father of Sarah Huling Leslie of the Discernment Research Group. Planetary Doomsday or Birth Day? What's with all the hoopla and hysteria about the date December 21, 2012? It is the culmination of a 25-year plan of the New Agers! In the New Age worldview, this global mystical paradigm shift would signal the beginning of a new world order. Most significantly, “Harmonic Convergence will not only signal a return of Quetzalcoatl, but the elimination of Armageddon as well,” says Arguelles. Moreover, he equates Quetzalcoatl with the Christ and says the Harmonic Convergence could be viewed as a second Pentecost. However, like the return of the Mayans, Quetzalcoatl also will not appear in the physical sense; he will do so as a wave length of a consciousness available to those who are harmoniously attuned. The current New Age hoopla over the December 21, 2012 date seems to indicate the same bizarre occult predictions. No wonder people are scared! Worldwide there is an ongoing panic about this supposed doomsday date. In an attempt to reassure the public, there have been many statements issued that attempt to counter the hype and hysteria. One such statement, refutes Arguelles’ calculations, and gives an fascinating perspective on what may have gone on behind the scenes prior to the Harmonic Convergence. “He claimed to be channelling various spirits, including the spirit of a Mayan king from the seventh century. He predicted a ‘shift in human consciousness’ - mass enlightenment.” The actual date of December 21 first appeared in an earlier work - a 1975 book by Terence McKenna, a writer known for his descriptions of “machine elves” seen while under the influence of drugs. The date appeared in McKenna's ‘Timeline Zero’ prophecy, and was based on McKenna’s own mathematics, the Chinese I Ching and a magic mushroom trip. McKenna later met Arguelles and the two became, Wilson says, part of a circle of New Age authors who cited each other’s work, lending the ‘prophecy’ an air of believability. A Mayan expert, a professor at Cleveland State University who teaches a popular class called “Ancient Mysteries,” factually reports that the Mayan calendar does NOT abruptly end on Dec. 21, 2012. Dunham says the doomsayers got everything wrong, starting with the image of a calendar often seen with stories about 2012. A: The story started with claims that Nibiru, a supposed planet discovered by the Sumerians, is headed toward Earth. This catastrophe was initially predicted for May 2003, but when nothing happened the doomsday date was moved forward to December 2012 and linked to the end of one of the cycles in the ancient Mayan calendar at the winter solstice in 2012 -- hence the predicted doomsday date of December 21, 2012. The spaceships were detected by HAARP search system. The system, based in Alaska, was designed to study the phenomenon of northern lights. According to SETI researchers, the objects are nothing but extraterrestrial spaceships. They will be visible in optical telescopes as soon as they reach Mars's orbit. The US government has been reportedly informed about the event. The ships will reach Earth in December 2012. The date of the supposed space contact with extraterrestrial civilization brings up thoughts about the Mayan calendar, which ends on December 21, 2012. Inmates in a women’s prison near the Chinese border are said to have experienced a “collective mass psychosis” so intense that their wardens summoned a priest to calm them. In a factory town east of Moscow, panicked citizens stripped shelves of matches, kerosene, sugar and candles. A huge Mayan-style archway is being built — out of ice — on Karl Marx Street in Chelyabinsk in the south. For true believers in prophecies like these, Doomsday is imminent and with great fear they begin to prepare for worst-case scenarios. Doomsday predictions are typically based on false prophecies and messages of impending doom. These date-setting movements are often led by charismatic leaders who head up cults, or who have developed a cult-like following of true believers. In these movements there is a huge psychological commitment to see the fulfillment of the predicted outcome. When this outcome fails to materialize, there will be alternative scenarios or explanations that are developed by the leaders – something that is already in evidence now with the backpeddling going on with the 2012 doomsday scenarios. Furthermore, when scholars, experts, media outlets or public officials attempt to refute the cataclysmic event, it can actually add to the cult-like view that there is a conspiracy going on. Doomsday true believers will explain that the “experts” are trying to hide the facts. They are seen as part of the conspiracy and coverup! In other words, any attempts at rational discussion can actually fuel the irrational belief in an impending disaster! In this free teleseminar, Dr. Stanislav Grof, globally renowned consciousness researcher, pioneer of LSD psychotherapy, and co-founder of transpersonal psychology, will explore the Mayan prophecy concerning the "end of the world" and similar prophecies from other cultures using the insights from his 50 years of research into non-ordinary states of consciousness. He will share how his explorations of the human psyche suggests new ways to understand these ancient prophecies in a way that offers us hope for the future. It is said that the Mayan calendar started in 3,114 B.C.E. It's ending is not precise but many scholars put it on the Winter Solstice, 2012. Wisdom University commemorates this extraordinary culmination and transitioning by organizing a pilgrimage to Teotihuacán, the pyramid complex outside Mexico City that serves as the heart and historic capitol of the Toltec civilization that designed the calendar. It was at Teotihuacán that the Toltec seers developed their extraordinary spiritual technology of the stars upon which their calendar was based. As the heart of Toltec wisdom, the land and energy of Teotihuacán is an enormous catalyst. This pyramid complex was built to show humans what is possible in their connection to the divine. Several thousand years later, it is still brimming with energy and power. The experience of Teotihuacán is difficult to describe. It is a place of cellular cleansing and rearranging, a mystical source of divine connection and wonder, and a super-charged spiritual battery rolled up into one potent package…. [T]apping into primordial wisdom is vital for our resiliency and our capacity to not only vision but embody a new way of being in the modern world…. The Teo journey is a sacred initiation ceremony designed to help each individual reclaim their deeper essence…. It is a true gift to go to places that are infused with intent and magic and let this energy seep into our bones…. 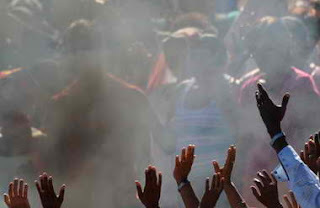 MAYA 2012: Personal & Planetary Transformation: Join the Global Gathering! December 13-22, 2012, With Special Entrance Inside Chichen-Itza, the Great Mayan Ceremonial Center and One of the Seven Wonders of the Modern World, at the exact time of the Winter Solstice! Your once-in-many-thousands-of-years chance to gather at the high center of Mayan Knowledge for the end of the Mayan Calendar… and the birth of the Great Cycle of transformation and renewal! Gregg Braden on this once-in-a-5,125 year experience as he shares the ancient discoveries of fractal time and the key to life-affirming shifts…. Hunbatz Men… a shaman, a holy man,… a respected ceremonial leader… [in] a unique blend of sacred and experiential ceremony liberally sprinkled with Mayan chants, prophecies, cosmic and solar wisdom, and language lessons. Robert Bauval (best-selling author of The Orion Mystery),…"Chichen-Itza is just the ideal place for the Winter Solstice of 2012 to witness the dawn of a New Age for Mankind…. Jim Berenholtz… In 1987 he was International Coordinator for the Sacred Sites Festival associated with Harmonic Convergence. Since 1989, beginning at the Mayan temples of Palenque, he has been performing transformational snakeskin ceremonies at sacred sites worldwide,… work[ing] with the sacred serpent energy… with live pythons and boa constrictors. Zoe Allison-Rockingbear is an Artist, Teacher, Healer, Mystic, Visionary, and Light Warrior. Her work explores the mysteries and magic of the dynamic human relationship with Nature and the marriage of Celestial and Terrestrial energies. Patricia Price is a healer and registered medium for the Lily Dale Assembly. She is a healer, breathwork practitioner, certified hypnotist and… she teaches Mediumship, Spiritual Healing and Ministerial Training. Free Spirit… will focus on the importance of the full activation of the pineal gland gateways, the nature of multi-dimensional reality, and the possibility that humans can become immortalized by the awakening of dormant DNA and Light Codes within the body. and spiritual insights for humanity. December 22, 2012: A Planetary "Birth Day"
Envision 100 million people uniting around the world to celebrate the birth of a new era for humanity with great love and fanfare – an historic day of global unity. We’ll link across the world in moments of song, prayer, meditation, dance, and cultural expression over a 24-hour cycle. We’ll share laughter, perform acts of generosity and commit to global cooperation. It will be a potent collective rite of passage marking humanity’s entry into a new era in which we are consciously evolving together. Our goal is to reach a critical mass of people – 1% of the world – committing to a positive future together. For the first time in our conscious history we are being given the opportunity to guide and ease our transition to the next stage of evolution. This situation is new for humanity, for we are the first Earth species to consciously face evolution or extinction…. Joining together, we can … guide our Earth community into its next evolutionary Stage. Humanity is facing unprecedented, evolutionary changes. It is amazing—out of the famous Mayan prophecy has come the indication that we are facing the end of this world as we know it and the beginning of the new world by 2012.This date corresponds to environmental and social predictions of breakdowns and breakthroughs now widely known. Let’s assume there is some validity in these prophecies. What vision of the future, of the new world, might we see so that we can place our attention upon this vision as a strange attractor to carry us through this critical transition? We notice that crisis precede transformation. Problems are evolutionary drivers. Intensifying pressure leads either to devolution and extinction or evolution and transformation. This is one reason that 2012 might be earthshaking and shocking to some…. Is it possible that from our species, a new human and a new humanity are now emerging?... Perhaps we will reach critical mass for this human by 2012. Some version of the twelve-sector solutions Wheel is now being used as a template by a number of groups around the world. The Wheel is not a two dimensional, flat pie, but rather a fourth dimensional sphere that keeps evolving through time. Each sector represents a vital social function, such as Education and Governance; together all the sectors offer us a portal into a whole new world. New solutions to our problems and new ways of thinking are constantly being created by pioneers around the world. Some become viral and change the whole field…. 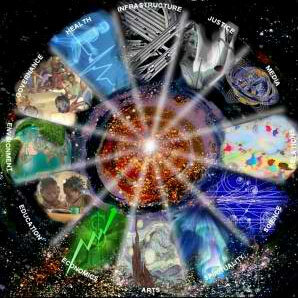 At the center of the Wheel, where the tip of each sector meets, is the heart, the Spirit of cocreation. Here are found the common values that all the best solutions share, such as dedication to the common good, compassion, fairness, a whole-systems perspective, long-term sustainability, and the spirit of community…..
All of this hoopla and hype about 12-21-12 amongst the New Agers illustrates that they have a global plan for a new spirituality. Shockingly, their plan merges with many of the agendas coming forth in evangelical circles. In this season where the church remembers the birth of Christ, it is more important than ever to remember why Jesus came to earth to redeem us from our sins, and to joyfully anticipate His second coming, a day which no man knows. Christians have the blessed assurance from Scripture that no matter what happens on 12-21-12 that they are perfectly safe in God’s precious caring arms. 1. http://herescope.blogspot.com/2011/06/new-age-date-setting.html "New Age Date Setting," June 8, 2011, Herescope. This article was republished from an old 1987 edition of The Trumpet, which talked about the Harmonic Convergence and how it was predicting the 2012 doomsday scenario. 16. https://www.wisdomuniversity.org/TeoOverview.htm Wisdom University trip was scheduled Oct. 28-Nov 3, 2012. Jim Garrison, president. 26. See the Dec. 6th Herescope post, "12-21-12: Evangelicals Believing Mayan Prophecies" and follow the links to previous articles, http://herescope.blogspot.com/2012/12/12-21-12.html. *EXHIBIT A at the top of this page is an AP photo attributed to Ramon Espinosa, published in the Cleveland Plain Dealer article by Michael Sangiacomo, “The end of the world as we know it on Dec. 21? Nope, says Cleveland State professor,” 12/14/12, Cleveland Plain Dealer, http://www.cleveland.com/metro/index.ssf/2012/12/the_end_of_the_world_as_we_kno.html The text with this photo says: "In this Dec. 6, 2012 file photo, people raise their hands during a ceremony by Mayan sages in Bacuranao, Cuba. From Russia to California, thousands are preparing for the fateful day, when many believe a 5,125-year cycle known as the Long Count in the Mayan calendar supposedly comes to an end." Click on the link to view the professor speaking on this topic. "The invasion of monsters began decades ago, and it quickly transformed the world of entertainment. With little resistance, an army of cute-ugly creatures swept into toy stores, television and movies. They now adorn children's clothes, bedding, wallpaper, lunchboxes and books. And many have pushed their way into children's hearts on the backs of seductive myths that mold their thoughts and manipulate their imagination. Some of these monsters are crude and cool like Stitch, Shrek and the serpentine aliens of Men in Black. Others appear wise and honorable like Yoda in Star Wars. But the creatures that win the prize for thrills and chills are the dark and deadly ones like Darth Maul, Tolkien's Orcs and the ominous aliens in Signs. They all serve a set of strategic social and spiritual goals: They entertain. They shift a person's attention from the real world to a more titillating realm created by those who write the myths and steer the imagination. They tempt Christian fans to re-imagine both God and themselves in the new context – thus bending the old realities to fit the new myths. They desensitize their fans to mystical images and symbols of evil. And they stir a craving for more intense excitement of the same kind. Eventually the real world of nature, families, work and Biblical truth becomes too boring to be enjoyed. Who cares about truth and facts when myths and fantasies seem far more exiting? Fantasy: Fantasy is a genre of fiction that commonly uses magic and other supernatural phenomena as a primary element of plot, theme, or setting. Many works within the genre take place in imaginary worlds where magic is common…. Fantasy has also included wizards, sorcerers, witchcraft, etc.... In its broadest sense, however, fantasy comprises works by many writers, artists, filmmakers, and musicians, from ancient myths and legends to many recent works…. Reality: In philosophy, reality is the state of things as they actually exist, rather than as they may appear or might be imagined…. Reality is often contrasted with what is imaginary, delusional, (only) in the mind, dreams, what is abstract, what is false, or what is fictional. The truth refers to what is real, while falsity refers to what is not. Fictions are considered not real. Horn, along with the many evangelical leaders who are associated with him, has put great stock in the 2012 date. But in order to bolster his case, he and his 2012 prophecy advocates have deviated far from Scripture alone (reality, truth), and have borrowed heavily from fantasy, legends, fables, myths, apocrypha and occult sources. Elsewhere we have documented this point extensively. Here is a current partial list, excerpted from Tom Horn's website http://apollyonrising2012.com/, of what he calls "a short sample of the HUNDREDS of new revelations in [his book] Apollyon Rising 2012." Nearly 500 years ago the Maya prophesied about the Colonial date 1776 as the beginning of the last 13 katuns leading to apocalypse in 2012. Over 700 years ago Orthodox Jewish priests prophesied in the Zohar that their Messiah would arrive in the year 2012. The first degree Masonic Tracing Board contains the same prophecy toward the year 2012. This secret is also openly hidden in the most spectacular way in the US Capitol Dome, directly tying the US and Vatican to the Mesoamerican 2012 date. A 200 Year Old cipher encoded on the Great Seal of the United States points to the same prophecy concerning the return of the gods in the year 2012. A couple modern "Mayan elders" - who have been getting themselves in the news lately by claiming the year 2012 will not lead to the end of the world - are covering up how their prophecies diametrically contradict the prophecies of their forefathers including the Maya, Aztec, and numerous other ancient peoples who foresaw this time as portending destruction and "judgment from the gods." It is NOT about the Nephilim! Arguments about Nephilim serve as a convenient straw man to deflect criticism away from the real issues at hand. The real issue is mixing Scripture with pagan sources. But it is no wonder that the Scripture saith so little concerning angels, because it was written for the use of men, not of angels; and God would hereby take us off from curious and impertinent speculations, and teach us to employ our thoughts about necessary and useful things. Imagination: …the ability of forming new images and sensations when they are not perceived through sight, hearing, or other senses. Imagination helps provide meaning to experience and understanding to knowledge; it is a fundamental faculty through which people make sense of the world, and it also plays a key role in the learning process…. In various spheres, however, even imagination is in practice limited: thus a person whose imaginations do violence to the elementary laws of thought, or to the necessary principles of practical possibility, or to the reasonable probabilities of a given case is regarded as insane. To postmodernists, the Bible is viewed as a myth, a narrative. It is no longer seen as Absolute Truth, God's spoken Word, reality or fact. Instead it is viewed as one of many myths and narratives from cultures past and present. In the postmodernist wordview one can add to Scripture with other stories and myths that seem to complement it. Scripture as myth, plus other myths, equals more revelation, according to this worldview. Tom Horn and his cohorts are postmodernists in the sense that they view the Scripture as just one of many stories that foretell endtime prophecy. In fact, they must view the Canon of Scripture as incomplete because they add to Scriptures with their fantastical ideas of secret hidden codes and mythological prophecies from ancient cultures. As such, they create a new reality. Their new reality is a dialectic synthesis of the Scripture plus fantasy. This then is no longer Biblical Truth, but a mixture. It creates an entirely new worldview, a fantasy world that becomes completely believable to those who are indoctrinated into its "new revelation" tenets. In sum, they create a new cosmic world with a new endtime scenario. This same writer has also observed that in classic fantasy stories there are two necessary ingredients: a hero and an evil reptilian monster. In the fantasy world synthesized by Tom Horn and his associates, the evil reptilian monsters are Nephilim and other scary hybrid creatures gleaned from a huge variety of occult sources. In fact, their unique fantasy world, their own "sub-created cosmos," includes a great battle with the forces of evil unfolding imminently on Dec. 21, 2012. No wonder their narrative is so enticing to so many evangelicals! It has all the elements of a great fantasy adventure! But it is based on fiction and myth, not biblical Truth. Bible prophecy plus mythology does not equal better Bible prophecy. It equals heresy. Restrained imagination does not stray from Scripture. But what about Nephilim? UFOs? Hybrid creatures and other space aliens? What if someone has an “experience” with these things? Well, the answer is quite factual. Stick to Scripture. If you don’t receive answers from plain Scripture, then stop. Stop in your tracks and don’t go off into speculations that lead to fantasy, mythology, fiction, or worse. The Scripture is sufficient. What Jesus told us about HIS return is sufficient. Anything else leads straight into the occult. If an experience happens to you that you can’t find a basis for in Scripture, set it aside. If it is REAL, and based on the Truth of the Gospel of Salvation message, you will read it in His Word. Sola Scriptura! Today's postmodern world has little tolerance for Biblical watchfulness. Instead, it embraces its mythical heroes with a driving passion that often eclipses both family and reality. The more shocking, crude and ugly, the more cool and captivating the product. Hollywood and toy makers know that well. many UFO enthusiasts and New Age leaders… began to circulate a far-out notion decades ago: A group of benevolent aliens or ascended masters would suddenly appear on the earth and cleanse it from all who resist its spiritual evolution toward global oneness. At the same time, they would prepare humanity to receive the prophesied New Age "Christ." Why are evangelicals so susceptible to confusing fantasy and reality? Why would we go beyond mere speculation on God’s Word to the point where we feel we must add to Scripture by mixing it with Mayan lore, apocryphal writings, UFO science fiction, mythologies and astrology? Have we all become so desensitized by Hollywood that we can no longer distinguish fantasy from reality? Are we so seduced by fanciful images? When Christians add myths and fables to Scripture they create a potent esoteric concoction, a mixture of theology and the occult. Isn’t this mixture precisely the sin of ancient Israel? By age ten, Jacqui K. was fascinated with anything supernatural. Since her parents set no limits, she read every fiction and fantasy book she could find on the magical world she craved. In her imagination, she met wizards and witches, power and excitement. " I continued reading Harry Potter-type books through grade school, high school and into college," she says. "Three to five a week! The older I got, the easier they were to find. The whole time I considered myself a Christian! If someone had pointed out to me what I was doing, I would have laughed. I was a normal teenager and a leader in my church group." and though the mountains be carried into the midst of the sea. neither is it far off. in thy mouth, and in thy heart, that thou mayest do it. is the LORD'S thy God. 2. Berit Kjos, “Aliens, Monsters & Creepy Creatures: What do they teach our children?” http://www.crossroad.to/articles2/2002/aliens.htm. This 2002 article has much to say about the current UFO phenomena. 5. http://herescope.blogspot.com/2011/06/doomsday-datesetters-2012.html citing Horn’s books Apollyon Rising 2012, pp. 66-67; Forbidden Gates, pp. 22-23, and Nephilim Stargates, pp. 108-115. 7. Matthew Poole, Commentary on the Bible, Vol. 1 (Hendrickson), p. 5. Circa 1600 A.D.
10. Randel Helms, Tolkien's World (Houghton Mifflin, 1974), p. 77, describing "Tolkien's World: The Structure and Aesthetic of The Lord of the Rings."